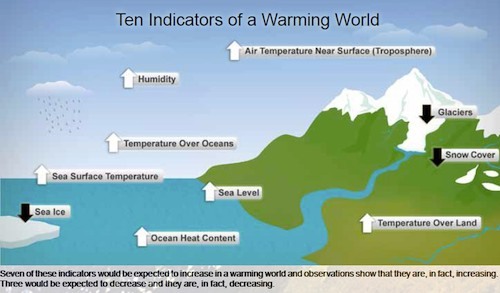 The annual State of the Climate report from the National Oceanic and Atmospheric Administration (NOAA) states the evidence is unmistakable that we live in a warming world, with the past decade the warmest on record. The report consolidates data from the oceans as well as the atmosphere, representing the first time for such a large-scale integration. 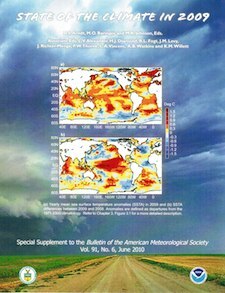 Published in the Bulletin of the American Meteorological Society, the study is based on observational data, not computer models. “It’s telling us what’s going on in the real world, rather than the imaginary world,” says senior scientist Kevin Trenberth at the National Center for Atmospheric Research based in Boulder, Colorado. This year’s report is the 20th annual State of the Climate report from NOAA, making it the “climate system’s annual scorecard,” says the report’s authors. The report also emphasizes that human society has developed over thousands of years under one “climactic state,” and that “a new set of climactic conditions are taking shape.” These new conditions are “consistently warmer” that will bring to some areas increased and severe drought, torrential rain, and violent storms. Peter Scott, head of climate monitoring for the U.K.’s Hadley Centre, stresses that even with year-to-year fluctuations from natural climactic event such as El Nino and La Nina, longer term decade-to-decade trends consistently derived from multiple data sources reveal a changing and warming global climate.